In the last column of Everything Deer, we discussed the dominance of native browse and vegetation in the annual diets of deer. Regardless if it is the dead of winter or the heat of summer, native habitat is providing the majority of their diet in most regions. Many believe that they are basically stuck with what they have, and that there is no way to manipulate the natural environment for their deer herd. However, there is a lot that can be done to create more and better quality native habitat. The fact is, if you aren’t already doing this, there is a chance that your deer herd is being limited in both quantity and quality. There may not be an easier way to create more native browse and vegetation than through some simple chainsaw work. 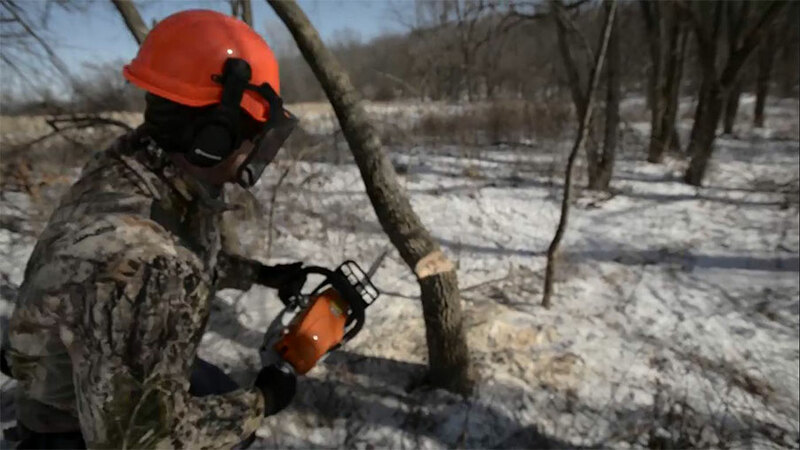 A chainsaw is a deer manager’s best friend. A single cut can create everything from woody browse to horizontal bedding cover to allowing sunlight to reach dormant seeds on the forest floor. It’s all about the selection. One thing that is commonly used on food plots, but not with the native habitat, is an herbicide. Deer managers in the South likely have the most use of herbicides in the planted pine stands. The goal with herbicides is to remove undesirable species, like sweetgum, and allow sunlight to reach the ground. Herbicides also are used in one of the simplest forms of timber stand improvement (TSI), the hack and squirt method. Using an ax or hatchet, a slice is carved into an undesirable tree. Then a strong herbicide, like Imazapyr, is sprayed into the cut, which will eventually kill the tree … eliminating competition and allowing sunlight to reach the ground. The effective method of “prescribed fire” is not used nearly enough in today’s deer management. Why? The general public thinks about out-of-control brush fires out West when the term is stated, but that is far from the case. A prescribed or controlled fire is just that; it’s meant to happen and under control. As native browse ages, the quality of the plant – nutritionally – will decrease. For some browse species, the older they become the less deer will use them. Prescribed fire is a way to control older browse when done appropriately. Most prescribed burns are conducted in the dormant season, which is late winter or early spring. Although food plots and supplemental feedings can benefit a deer herd, the true support of deer survival is with the native habitat. In order for your deer hunting and herd quality to reach its potential, you must manage the habitat.